Before Pittsburgh’s light-rail “Tunnel to Nowhere” under the Allegheny River came along, my favorite Port Authority boondoggle was the Wabash Tunnel under Mt. Washington. Most Pittsburghers know all they need to know about the notorious "Tunnel to Nowhere." Still under construction and still disrupting downtown Pittsburgh after three years, it's the 1.2-mile, $528 million extension of "The T" (Pittsburgh's light-rail line to the South Hills suburbs) from Gateway Center under the Allegheny River to the North Shore (where the Steelers' and Pirates' subsidized playpens are). The "Tunnel to Nowhere's" humorless fathers and mothers at the Port Authority of Allegheny County, the local Big Transit franchise, prefer to call it "The North Shore Connector." But whatever they call it, their baby is still probably going to cost upwards of $.7 billion by the time it's done in 2012. That's when it will begin providing desperately needed cheap public transportation to its key customer base -- Steeler and Pirates fans too lazy to walk across one of four bridges that already connect downtown and the ballparks. As for the humble Wabash Tunnel, most Pittsburghers have never heard of it and it’s a statistical certainty that most of them have never passed through its innards since it quietly opened in early 2005. Originally part of the grandiose “Airport Busway” plan, the tunnel's rebirth is a textbook case of the confluence of dumb federal regulations, “free” federal transportation money, and criminally stupid local transit officials. As a local historian nicely explains and illustrates in “Pittsburgh’s Money Pit,” the tunnel has a long, sad and bankrupt life. To turn it into the Wabash HOV and make it suitable for car traffic, the Port Authority had to pour about $40 million in federal, state and local tax money into it. The ramps from the tunnel portals on each side of the hill to the existing road levels were about $10 million. Even if it had connected to an underused $326 million busway as planned, the Wabash would have been a waste of everyone’s money. 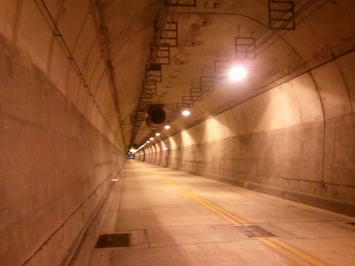 As a stand-alone tunnel for cars under Mt. Washington, the hill that separates Downtown Pittsburgh from the city’s southern suburbs, it was and still is worthless. Paul Skoutelas, in 2005 the Port Authority’s Chief Exaggerating Officer, tried to justify the 3,600-foot tunnel by saying the Wabash HOV would alleviate commuter congestion on the Fort Pitt and Liberty bridges, the two main arteries into downtown from the south. That claim was always an absurdity bordering on a lie, since 200,000 vehicles a day used the two bridges in 2005 and the Wabash was projected at its peak – in 2015 -- to handle a whopping 4,500 vehicles a day. That 4,500-car projection – a typical example of the phony projections Big Transit monopolies make when they justify their future fiascos – will only materialize if an earthquake closes off every other route from the south to downtown. Five years after it opened, the Wabash is what everyone knew it would be – a $40 million low-occupancy joke that costs the Port Authority of Allegheny County hundreds of thousands of dollars a year to maintain. When I drove through the Wabash LOV Friday, Dec. 3, during rush hour, I found myself riding in the only car in the tunnel. It was so lonely in that yellow tube at 6 p.m. that I decided to stop midway, jump out and take the picture at the top of the page. Back in 2007, the number of cars using the Wabash LOV tunnel every day was about 150 – a cost per trip to taxpayers of about $12, according to a local think tank. In the upside-down world of Big Transit accounting, that’s probably a bargain. For some strange reason, the Port Authority doesn’t bother to keep track of the number of vehicles using the Wabash each day on its otherwise statistic-filled Web site. I've got a couple of calls into my friends who do the PR for the Port Authority. They'll eventually call me back with the official figures. But even if they don't, it's safe to assume that the Port Authority's tunnel of LOV is still a long way from hitting that phony 4,500 projection. Bill Steigerwald, a free-lance libertarian writer who recently retired from daily newspaper journalism, loves his native Pittsburgh but hates the political and corporate power brokers who've been damaging the city for 60 years. His columns are archived at the Pittsburgh Tribune-Review and his 2000 article for Reason magazine on the city's abuse of eminent domain powers is here. Photo: Evening rush hour in the Wabash LOV Tunnel at 6 p.m. Dec. 3, by author. Submitted by rihan on Tue, 06/03/2014 - 06:39. Submitted by tslrm on Mon, 06/16/2014 - 04:52. Submitted by tslrm on Thu, 05/22/2014 - 04:27. Submitted by laciedwhite on Sat, 08/31/2013 - 11:42. Submitted by tslrm on Tue, 05/20/2014 - 05:56. Submitted by tslrm on Mon, 05/19/2014 - 09:04. Submitted by robert1122 on Thu, 08/01/2013 - 05:27. Submitted by clowncar on Fri, 08/12/2011 - 15:51. Shhhh! The Wabash is my favorite tunnel in town! There is nothing like cruising through there with the windows down and honking your horn all the way through. *Great* reverb! Of course, once in a blue moon, there's another car in there with me and I have to be quiet. And once?! There were TWO cars in there with me! I was really miffed. Submitted by rich_b on Fri, 12/17/2010 - 12:06. Meanwhile, roads Pittsburgh residents actually use don't get what they need. So money can be spent instead on these stupid projects. If it isn't a road for auto traffic, any project "designed" to decrease congestion is a lie, pure and simple. Light rail and bus ways NEVER have high enough ridership to decrease congestion by very much. At least vs the cost of construction and maintenance.